Coffee time The Office style all thanks to this Stanley Do Not Care Mug. 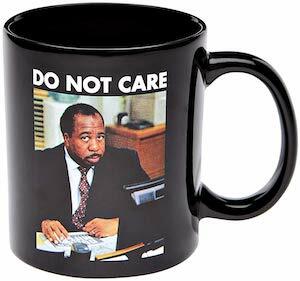 This ceramic mug is black and on the back you can find a big logo of The Office and on the front you find a photo of Stanley Hudson while at work at Dunder Mifflin and above the picture it says “Do Not Care” and we all know that Stanley does not care. Your new The Office mug is 20oz and great for coffee, tea, or any other beverage your prefer but Stanley is sensitive so the mug is hand wash only.